The Cuban parrot is found in Cuba, the Bahamas, and the Cayman Islands. It is a medium-sized green parrot, and it is also sometimes called the white-headed parrot because of its white crown which makes this species easily recognizable. It has a pinkish-red throat and cheeks, and its belly is a dull purple-pink color. Its flight feathers are cobalt blue in color. Adults reach about 12 to 13 inches in length. 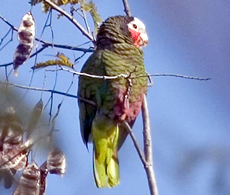 Cuban parrots can be found in forests, woodlands, and palm groves. They feed on a variety of fruits, including wild guava, poisonwood berries, pigeon berries, and the fruit from gumbo-limbo and pond-top palms. They also eat seeds from pine trees. These parrots rely on abandoned woodpecker holes in trees, mainly palms, for nesting. When tree holes aren't available, they are forced to nest on the ground, making them vulnerable to predators such as cats, wild boars, and snakes. Little is known about the reproductive behavior of this species in the wild. Cuban parrots are threatened by loss of habitat, illegal capture for the pet trade, and occasional natural disasters. Historically, these birds were common family pets, but today, it is illegal to take a parrot from the wild and keep it as a pet. Copyright Notice: This article is licensed under the GNU Free Documentation License. It uses material from the Wikipedia article "Cuban amazon". Glenn, C. R. 2006. "Earth's Endangered Creatures - Cuban Parrot Facts" (Online). 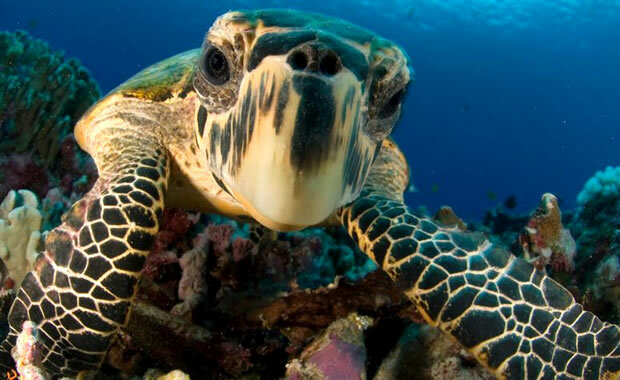 Accessed 4/24/2019 at http://earthsendangered.com/profile.asp?sp=333&ID=5. Need more Cuban Parrot facts?